The first stages of updating this website and OxfordshirePast are now complete. The updating of the main OAHS website is still in progress. 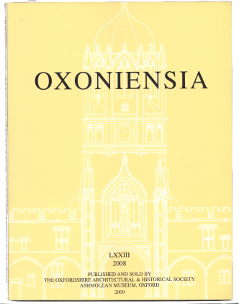 Oxoniensia is the annual journal of Oxfordshire Architectural and Historical Society (OAHS). It is one of the foremost archaeological, architectural, and local history journals in the country. It includes excavation reports, surveys of buildings and standing structures, and articles on the history and topography of Oxford and Oxfordshire. The year's volume is generally published towards the end of the year. Volume 83 (2018) is now available. 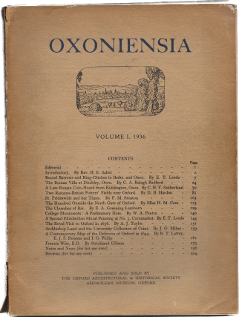 Oxoniensia is a refereed journal. Oxoniensia first appeared in 1936. The early volumes contain a remarkable mix of history and archaeology, including some of the very earliest aerial photography. Publication was maintained through the second world war, though paper shortages meant that volumes were short and produced in very small runs. Most of the early material now made available on this site has until now only been available in a few libraries, mostly in Oxford. Lest it [Oxoniensia] should in time degenerate into the same sort of annual report that the Proceedings eventually became, the committees responsible for its inauguration have decided that accounts of the Society’s meetings and excursions shall not be included in its pages. And, to prevent its falling by the wayside through lack of a direct appeal to the main body of its potential subscribers—those resident in Oxford and its neighbourhood—it has been decided that no articles shall be published except those dealing directly with local topics. If those who control its policy in future years abide by these two rules, there is no reason why Oxoniensia should not go from strength to strength, and attract supporters in ever-increasing numbers from the ranks of those to whom the history and antiquities of the Oxford district are a source of interest and delight. ISSN 0308–5562 © Oxfordshire Architectural and Historical Society, 2010-2019; all rights reserved.